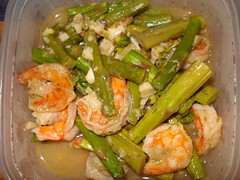 Hot Garlicky Shrimp with Asparagus and Lemon | Mmm, Tasty! We’ve been trying to cook more tasty things at home recently, because we’d gotten out of the habit and had been grabbing more prepared meals or things like sandwiches or burgers. This dish was a huge hit and was pretty easy to make. In fact, it was such a huge hit that I forgot to snap a photo until the next day, when I opened the left overs! Believe me, it looks even more tasty when it’s freshly made. This recipe is from Fine Cooking’s May 2007 issue. It is supposed to make 3 servings, but if you serve it over rice or pasta, you can easily get 4 or 5 servings out of it, depending on how hungry you and your guests are. Sprinkle the shrimp with a bit of salt and a few generous grinds of black pepper. Put a 12 inch skillet on med-high heat and add 2 Tbsp of the oil. Once the oil is heated and bubbling, add the shrimp in a single layer and cook 2 minutes on the first side, then turn and cook for only 1 1/2 minutes on the second side. They should be slightly browned but undercooked at this point. Remove from the heat and transfer onto a plate. Reduce heat to medium and add the remaining oil. Add garlic and cook for about 30 seconds, just long enough to get it sizzling. Add asparagus, lemon zest, red pepper flakes and a sprinkle of salt. Cook, tossing often, until asparagus looks blistered and the garlic is lightly browned, about 2-3 minutes. Add the broth and cover, leaving the lid ajar. Cook until the asparagus is tender, about 1-2 minutes. In a small dish, whisk together the cornstarch with a Tbsp of water. Add that into the asparagus mixture and stir to combine. Heat until boiling, then stir in the shrimp, reducing heat to low. Cook, tossing often, until the shrimp are cooked through, 1-2 minutes. Add in lemon juice and more salt and pepper as desired. Serve immediately. This dish goes nicely over a bit of whole wheat pasta or brown rice.